What a wonderful coincidence! While googling for the identity of my red dragonfly, I came across the ID for this beautiful chartreuse one that I captured in April this year! 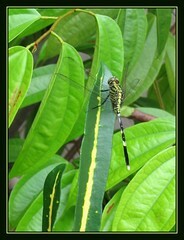 My very first capture of a dragonfly in our frontyard garden. This Slender Skimmer is another gorgeous Orthetrum species which is quite common and widespread! 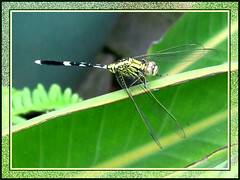 It is dressed in pale greenish yellow with contrasting black stripes on its thorax. These fabulous colors continue right down to the first 3 spherical segments of the abdomen which then changes dramatically to black and white throughout the rest of the abdominal length. As dramatic too is the sudden tapering of its abdomen at mid-section (4-6 segments) which then expand at the 7-10 segments! What beautiful colors, pattern and formation! Male and female of this species are similar in appearance. Habitat: Open habitat around rivers, shallow lakes and ponds, marshes and gardens. Location: Found in Asian countries of China, Hong Kong, Taiwan, Japan, Vietnam, Thailand, Myanmar, Laos, Kazakhstan, Russian Federation, Malaysia, Indonesia, India, Sri Lanka and Philippines. Also found in parts of Australia, Middle East and Northern Africa. i was reading where they are found. I live in Georgia USA and just saw one on my back patio and it was beautiful. I never seen one before. Thanks, Mike for sharing this info here.